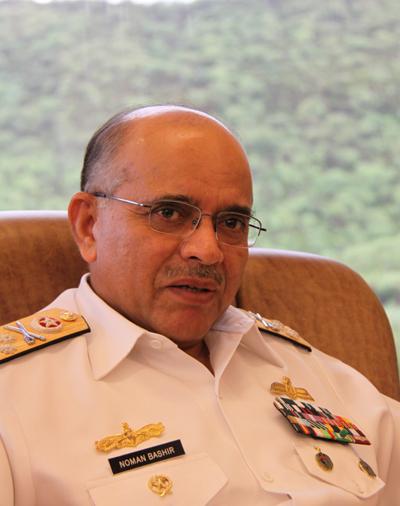 Pakistan's navy is very satisfied with the performance of the F-22P frigate it bought from China and hopes to further the cooperation with the nation, said Admiral Noman Bashir, Pakistan's Chief of Naval Staff. Two of the four F-22P frigates it ordered are already in service in Pakistan Navy, with the third one scheduled to be commissioned on September 15 this year. It's also expected that all four ships will be in service by 2013. "We are very happy with the performance, and some technology is as good as in Western countries," said Noman Bashir, who visited China four times last year. Pakistan also hopes to buy bigger ships with more firepower from China, such as 4,000 ton class frigates. Pakistan has proposed to develop strategic maritime cooperation with China in both military and commercial sects, such as in fishery, economic development zones, and cargo, he said. "The friendship between China and Pakistan is greater than the Himalayas and deeper than the Ocean. We already made progress in air force and other areas, now we should further and expand the cooperation in Navy, a broadly-based relation." Pakistan's strategic geographical location in the Arabian Sea and its long coastline mean its possible contribution to the missions of China's navy, particular under the context of energy need from the Persian Gulf, said Pakistan officials. Pakistan also has rich experiences in countering illegal activities at sea in order to maintain maritime security, four ships participated in anti-piracy operations, and there has been no act of maritime terrorism in its region in the recent past. "We can provide facilities, ports, logistics, maintenance among other things (to Chinese navy)," said a Pakistan navy official. Pakistan hopes to buy more ships from China, UK and France according to its development plan. TV programming is booming in China and Hunan TV is in the lead. Wang Yan in Changsha reports. Geely is expected to complete it takeover of Swedish luxury car brand Volvo from US automaker Ford Motor Co on Monday. Celebs attend Red Cross Ball in Monte Carlo July 30, 2010. Wherever have you been, share your travel photo and your joy on the oroad.